What’s inside the North Tower? Construction on the North Tower began around 1450, but its completion took almost 130 years thanks to budget problems (city money was needed for more pressing concerns, like keeping out the Ottoman Empire). A small lift runs up to a stone viewing platform that surrounds the bottom of the green-domed bell house that caps the tower (see the photo above). The platform is open air and gives you lovely views in all four directions. However, the view to the south and southwest is blocked by the cathedral roof. 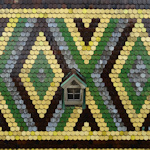 This is actually a good thing: it means you get a perfect close-up view of the multicoloured mosaic roof tiling. You do still get views across much of Vienna, and large labelled photos allow you to understand what you’re seeing. However, some of the city’s iconic buildings are behind the roof (the Hofburg and Schönbrunn Palace, for example). Nevertheless, you can see across to the Prater area and the famous Riesenrad Ferris wheel, various churches (e.g. Votivkirche, Jesuitenkirche, Franziskanerkirche), and some of the newer buildings, such as the DC Tower or Wien Mitte station building. And there are glimpses of Belvedere and the Rathaus to be had. If you’re just interested in the cityscape, then the cathedral’s South Tower is taller and has clear views in all four directions from its observation chamber. However, there is no lift…just steps: 343 of them. Nor does it offer quite such wonderful views of the roof. Another advantage of the North Tower is the famous Pummerin bell that the viewing platform surrounds. This is one of the largest free-hanging bells in the world, weighing in at over 21 tonnes and almost 3m high. The Pummerin is relatively young, dating back to the early 1950s. It’s made from the remains of its predecessor, a bell from 1711 that fell and shattered during a fire at the end of WWII. The old bell was itself built from Turkish cannons captured at the 1683 siege of Vienna (you can still see its clapper in the catacombs). The new version only rings on special occasions (like Easter or the death of a Pope). Indeed, most of Austria holds its collective breath at 11.59pm on December 31st, and waits for the Pummerin to ring in the New Year on radio and TV. Adults pay €6 to go up: there’s a ticket counter next to the lift. The latter has an attendant, so simply wait at the bottom (or top) for them to arrive and beckon you inside. The North Tower is, of course, included in the cathedral’s all-inclusive ticket (available from ticket counters or in advance*). When I visited, the tower opened from 9 am to 5.30 pm daily. Check the official website for up-to-date times, prices, etc.. Tall, mesh fencing surrounds the stone platform, which is quite wide. So there’s plenty of room up top, though be warned that the view down is somewhat sheer in places. There’s also one set of stone steps between two viewing areas. You can still see most of the view without going up to that separate area, though, if the steps bother you. In addition to the views and roof, be sure to look at the other details on the building, such as floral stone carvings largely invisible to those down below. See the information on St Stephen’s cathedral for directions and public transport tips. Once you’re inside the cathedral, head up the left side to find the north tower lift and ticket counter.